Also includes bottle, spoon, bowl, 2 food packets, bib and 2 diapers. Try-Me highchair-style packaging. 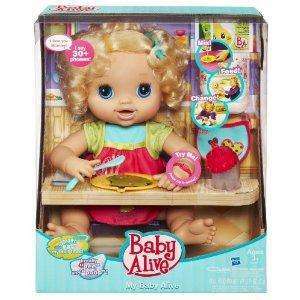 Love and nurture the doll that does it all with My Baby Alive . Hungry, sleepy and a big fan of cuddles, this cute blonde tot needs all the love and attention of a real newborn. She really eats the food you mix up for her, drinks from her bottle and needs her nappy changing! The chatty little thing says 30 phrases and comes with all the accessories you need to look after her, including: Bottle Spoon Bowl 2 food packets Bib 2 nappies Baby Alive - My Baby Alive - Blonde makes a great playmate for children aged three and up . Requires two AA batteries (included). superb piece of kit for the 11yr old that wants to be a pramface by 15. Should've bought the other one too!!! !